Topic: Mythic King Rastakhan downed! Topic: Legion Antorus mythic kill pics. Topic: Antorus the Burning Throne Heroic Cleared! Topic: Mythic Maiden of Virtue down: Fifth Sin gets 7/9M ToS! Topic: Fish Lady Smacked Silly! Hah, I hope someone recorded, would like videos from all our mythic bosses if possible tbh. We didn't get it on monday, we got close, but we did get it tonight! Only took us a couple of attempts then we downed it nice and smooth! Well done everyone! Hey, we have talked it over and we have decided we would like to offer you a trial spot, so if you accept simply contact any officer ingame for an invite. Yeah I don't see any issue with that, simply contact any officer ingame for an invite and refer them to this forum thread. Hey, thank you for applying. We will get back to you here with an answer or some more questions once we have had time to look it over and discuss it. 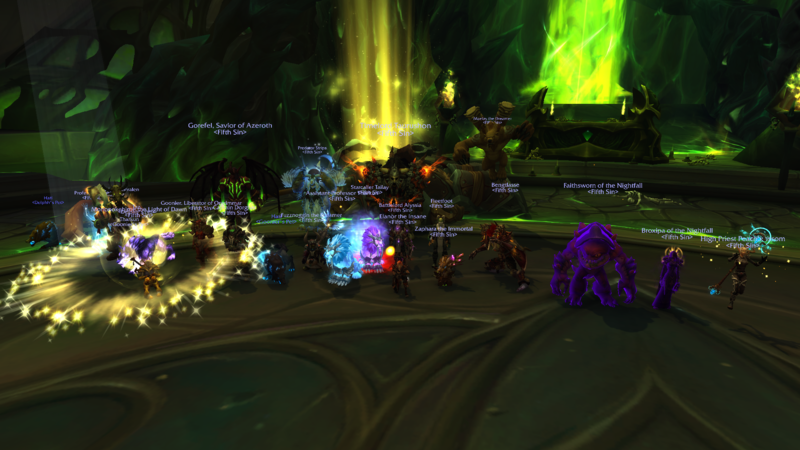 Topic: Mythic Demonic Inqusition wrecked! 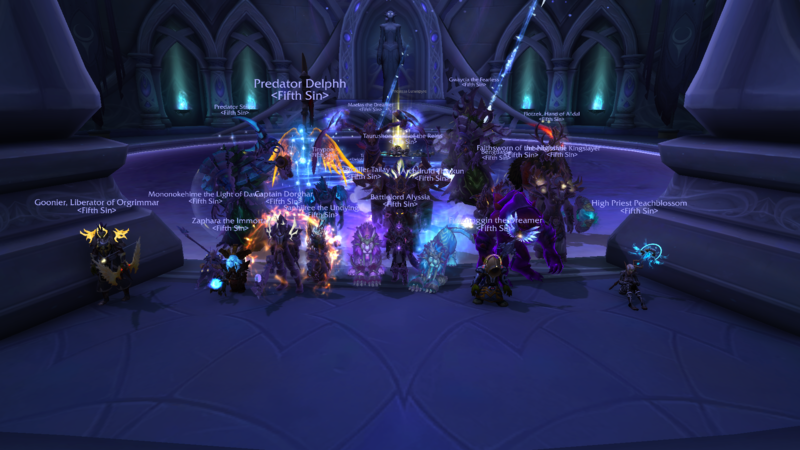 After a patch day raid plagued by disconnects, addon issues and server crashes our Monday raid started of good and only got better We killed if Demonic Inquisition in what seemed like a flash, well done everyone! Alright, well if it suits what you are looking for in the game better then I can understand that, hope you get better soon and take care! Topic: Mythic Harjatan wrung out to dry! Thank you for your application, we will get back to you with an answer once we have had a chance to fully review it and talk it over. Topic: 2nd week of ToS - Avatar down, did some mythic attempts! Just wasn't impressed, lack of experience mainly, but also low effort app. Which isn't to you you stood no chance, but I'd advise a bit more effort when you apply to your next guild, also some good logs go a long way when you have little in terms of experience to show in past tiers etc. We have talked it over and decided we will be declining your application. Hey there, thank you for your application. We will take a closer look, talk it over and get back to you. Topic: Mythic Star Augur Etraeus! Hey there, I'm afraid I will not be offering you a trial spot, however if you want to you may join us on friends rank.